Ok, well… that’s kind of a lie. I am writing this on Thursday, October 13th and will fill in details as they become available. As it truly stands (for me – in this moment), there are still some audio fixes in the beginning and the whole final scene to shoot with the First Doctor and Susan. A couple of years ago now, my friend Bob Mitsch had made connections with the owner of the TARDIS console from the 1996 TV movie featuring the Seventh and Eighth Doctors. Paul Salamoff, the aforementioned owner, was kind enough to let us visit the console – this amazing piece of nerd history – and take some pictures with it. Bob Mitsch himself has put together a number of amazing costumes over time including Doctors, companions and monsters. Standing at the console and considering all of the resources available to us, I knew that we had to shoot something. But what? Living in LA, I thought it might be neat to do something that embraced the scenery. I wanted to do something new and am pretty sure we haven’t really seen The Doctor in Hollywoodland before. I wrote a twenty-something page script. The idea was that a former companion of The Doctor’s had written down their adventures wtih him and sold them as Hollywood scripts, becoming a successful film executive. I liked it. I mean, I thought it was really cool, but it was a bit adventurous. It ended with a music video montage of Doctors Four and Eleven along with Amy Pond exploring the Los Angeles landmarks. Also – Bob and others have put serious effort into some pretty amazing costumes. If we have costumes for each of the eleven Doctors, I didn’t want to limit it to just two or three of them. Bob ALSO has an amazing Cyberman costume that I’ve wanted to put in some sort of project. I also had access to a Dalek. I really have no idea why we didn’t use it. Paul Salamoff, Bob Mitsch, Athena Stamos, CJ DeAngelus, Dalek Pete, Kevin Kittridge. Funnily enough, Mitsch doesn't actually play the 7th Doctor in the short, but brought his costume to get some shots of 7 and 8 at the Console. AND NOW it is DECEMBER 12th… I had to rewrite the last scene because I couldn’t score an edit bay (as a location). I’m pretty happy with it. * The majority of people in this video are not actors; merely passionate fans doing me a favor. * “Your wig for Eleven is terrible!” – – I know. It’s what we were stuck with. * “Your accent is terrible!” – – I know. Perhaps the First Doctor was right: maybe I shouldn’t try the accent if I can’t do it convincingly. 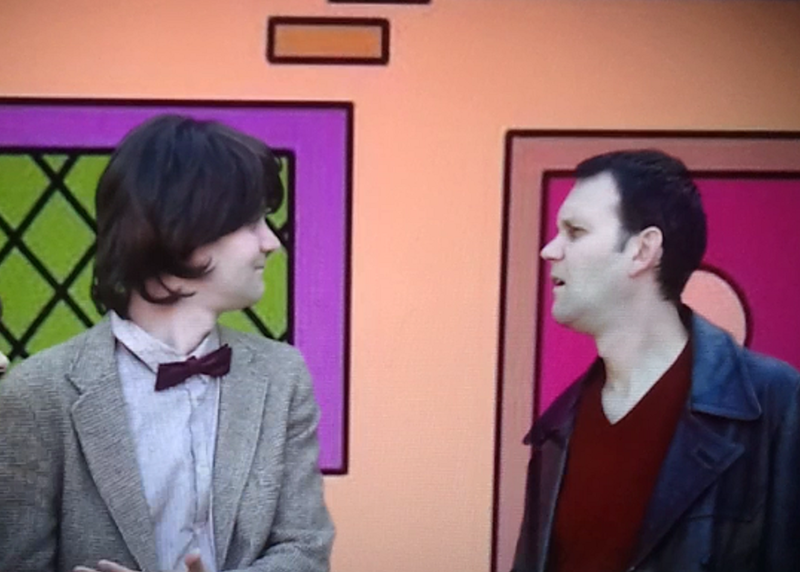 * “The 5th Doctor’s hair is supposed to be blonde!” – – I know. I wasn’t going to ask Brad to dye his hair. * “You used a semi-colon improperly in the first preemptive note! !” – – Sorry, you’re probably right. * I don’t play guitar. It shows. Sorry. * “The TARDIS time rotor isn’t supposed to have those white arcing lights on it!” – – How do you know? You’ve only seen it in one adventure. * “The Master’s TCE shrinks people to DEATH! And he can’t bring them back to normal size, what the heck? !” – – Hey now, we’re trying to have fun. * “How come when the 2nd Doctor come out of his timeline he’s in color, but when the 1st Doctor is seen he is still in black and white?” – – I’ll explain later. I’m sure other notes will arise. Please keep in mind that I’m far from perfect and we were trying to have fun. Not only does Paul own the 8th Doctor’s TARDIS console [and that Dalek], but he’s a very accomplished writer and producer of science fiction. And also the great Bob Mitsch. Not only did he supply the majority of the costumes, but he helped wrangle fans from his nerd army to help play characters in this. He’s also a great friend. And another great friend, the incomparable Rick Schultz. Rick shot this, edited it, did all the special effects and also co-directed. Furthermore, he’s more creative than I am. When I first had the idea for this, the band was going to be playing in an all-white environment (all E-Space like), and the TARDIS was just going to have a black background. Rick convinced me that he could make them cool. To be honest, I think a big part of the reason he took this on was to see what he was capable of doing with the effects (but mostly he did it simply to help me out). So I hope you like it. If you find yourself in the Los Angeles area, you should check out my improv group. So Bob… you writing an adventure for us to shoot or what?